Easy and instantly clean up and free up more storage space that’s what you need Just Cleaner for! Additionally, you’ll get all in one tool cleaner featuring memory booster, device optimizer, CPU cooler and battery saver. The efficiency of our junk cleaner is proven: about 4 mln people have been using it! Are you suffering from lag and freeze of your device all the time? Is your phone always running out of space? Is your battery draining faster than before? If you’ve got even one “yes” for the questions above, our mobile cleaner and speed booster is the right trash manager for you! With the advanced monitoring process our cache cleaner can intelligently empty background processes, stop stealthy running apps and disable stealthy auto-start apps. 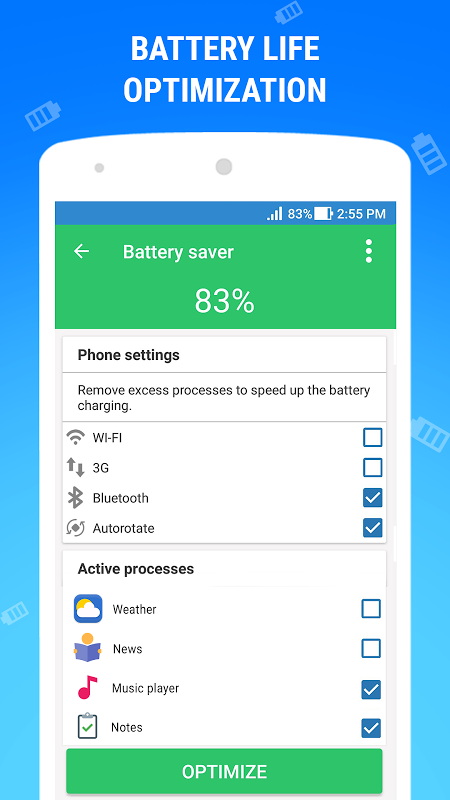 Just Cleaner Highlights: ☆ MEMORY and GAME BOOSTER - forceful phone speed booster Our device cleaner and booster kit analyses stops background process, frees up phone memory. That allows to optimize games and apps performance and moreover efficiently extend battery life. ☆ JUNK FILE CLEANER - powerful cleaner, space saver This cache and ram cleaner has accurately analyzed thousands of apps and detect trash including residual files, temp files. 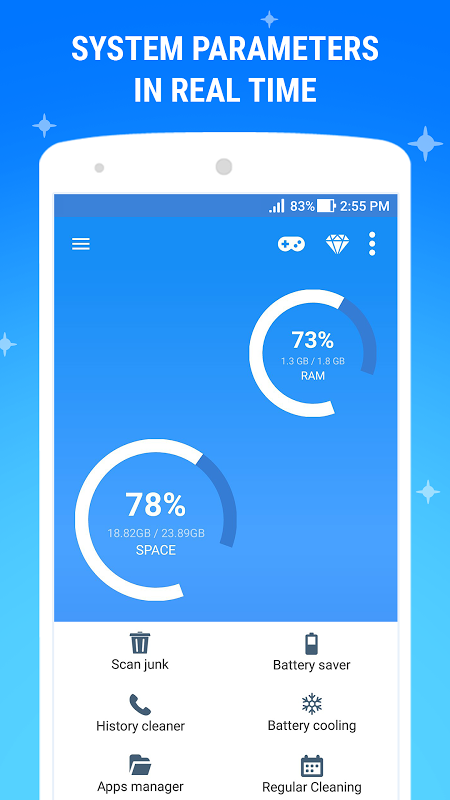 As a result, it cleans cache junk with one tap, frees up space and boosts phone speed. 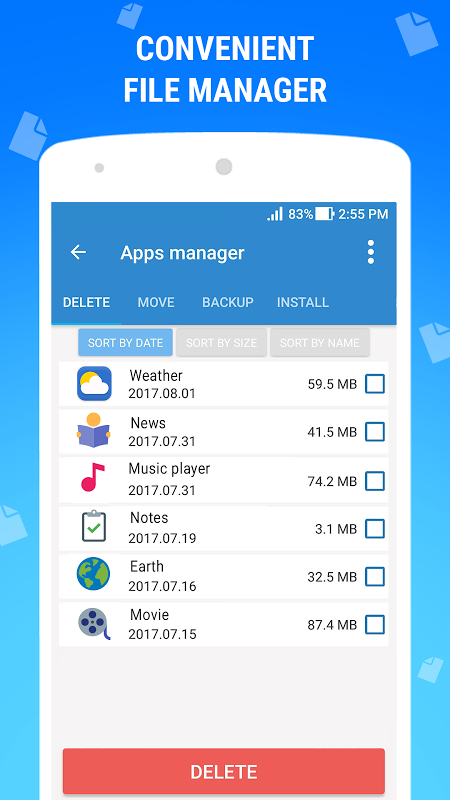 ☆ APP MANAGER - runs your apps and files intelligently Detects rarely used or consumption apps that occupying space and slowing down your device and uninstalls them. Our Task killer also moves internal storage apps to external SD card. That will give you enough free space for more desirable apps and files. ☆ CPU COOLER - instantly cool down phone temperature The less apps are running the less your phone or tablet are heating. So our memory cleaner ‘ll kill two birds with one stone: checks temperature and make your battery last longer by reducing usage of overheating apps! ☆ Fast, compact and efficient app ☆ Speed up your device with a tap ☆ Extend battery life and prevent overheating ☆ Boost up memory and save space ☆ Smart Design: user-friendly interface, that is easy to use Just Cleaner is an app featuring RAM, empty folder and browser history cleaner, ram and speed booster and Android optimizer. With intuitive interface, it can clean junk file, cache, ads, unnecessary background apps and in one tap boost up mobile memory to make your phone faster. Enjoy the highest performance of your phone after downloading and using our app.  Is Just Cleaner yours? Claim it!